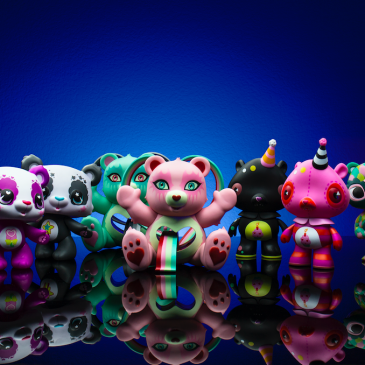 Urban Outfitters and Kidrobot are joining DIY forces once again to celebrate MUNNYWORLD with LIVE SKETCH EVENTS featuring KR faves Marka27, Shawnimals and Julie West. Celebrating MUNNYWORLD, Julie West busted out her brushes for a live painting of a Mega MUNNY at KRSF this past Sunday. Fans flocked to Kidrobot San Francisco last night for a live Sketch Session with artist Julie West. Kidrobot San Francisco is proud to present Dunny artist and painter, Julie West for a Sketch Session on Thursday, April 7 from 6-8pm. Mugo Player is a functional art toy/ flash drive/ Mp3 player that blurs the lines between art, toys, music and technology. Julie West will be exhibiting her new solo show, Itsy Bitsy at myplasticheart on August 27. Often quirky, bizarre, or ironic, Julie looks heavily at the way people live and define themselves.